Reiterating the positive economic news of recent weeks, the Fed announced plans to taper its quantitative easing (QE) program in January. This will be the central bank’s first step toward withdrawing its unprecedented support for the U.S. economy. The token reduction in bond and securities purchases follows a series of positive reports suggesting the economy is better positioned to mount a self-sustaining recovery. Third quarter GDP growth significantly exceeded expectations, job gains have surprised to the upside, retail sales have been solid and the housing market appears to be on solid footing. In addition, an impending budget deal will offer fiscal stability for the coming two years, removing risks of another government shutdown and additional sequestration. More importantly, the budget deal will eliminate some of the brinkmanship that heightened uncertainty and stymied economic performance. While the taper will likely lead to modestly higher interest rates, the Fed’s stance remains dovish and leaves the door ajar for future intervention. Following its December meeting, the Fed announced a reduction of its monthly bond and securities purchases, edging the acquisitions down to $75 billion. The $10 billion reduction will be applied equally to Treasury bonds and mortgage-backed securities and begin in January. In a move consistent with the nature of the most recent QE program, the central bank declined to announce an end date to its bond and securities buying. This will moderate risks of overreaction by equity and capital markets, though some uncertainty will persist. Should the economy continue to build momentum, the Fed may announce further reductions to its asset purchases when Bernanke convenes his last FOMC meeting as Chairman in late January. To alleviate stress caused by the withdrawal of stimulus, the Fed offered new guidance on the federal funds target rate. With inflation at the lowest level since 2009, plans to lift the overnight rate when unemployment falls to 6.5 percent have been extended to “well past the time” that level is reached. Most of the members of the FOMC anticipate the rise occurring in 2015, while a handful of officials expect the first rate hike in 2016. This extended outlook will lend stability to the financial markets. The third round of quantitative easing (QE3) started in September 2012 with the Fed committing $40 billion per month to the purchase of bonds and mortgage backed securities. The intent was to bolster economic activity by boosting liquidity and by restraining long-term interest rates. The following December, the FOMC increased the monthly acquisition budget to $85 billion. Interest rates remained exceptionally low, and were instrumental in the recovery of the housing market. In May 2013, Bernanke hinted that he may begin tapering the program, triggering a rapid escalation of interest rates to nearly 3 percent. Treasury rates receded in September when the Fed chose not to taper, but they have remained in the upper 2 percent range since. With the implementation of the taper, interest rates will creep higher, but with much of the change already factored into the figures, a spike in interest rates will be unlikely. The taper announcement will have little immediate impact on the commercial real estate investments. 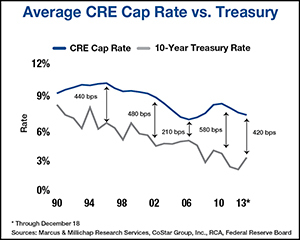 Although the rates on the10-year Treasury will likely drift upward, cap rates for most commercial assets will remain contained as spreads tighten for both the competitive lending institutions and buyers. Only properties with very low cap rates such as premium net leased assets or top tier apartments in prime markets face a potential lift in cap rates in the short-term, and even for these best-in-class properties with ultra-thin spreads, any movement would be nominal. This entry was written by marcusmillichap, posted on December 19, 2013 at 9:58 pm, filed under Uncategorized and tagged atlanta, CRE, national retail group, retail. Bookmark the permalink. Follow any comments here with the RSS feed for this post. Trackbacks are closed, but you can post a comment. Thanks for sharing this information on the Taper Quantitative Easing. I’ll certainly be looking to follow up on how this could impact commercial real estate in my area.